​​Kids eat more healthy foods. Kids who regularly eat family meals with their parents or caregivers consume more fruits and veggies and less soda and fried foods, according to research. This results in higher consumption of key nutrients such as calcium, iron and fiber, which are essential for growth and development. 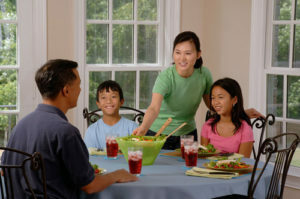 Family mealtime is a perfect setting for introducing new foods. Incorporating new foods into meals not only expands kids’ knowledge, but also their tastes or desire for new foods. In a study published in the European Journal of Clinical Nutrition, children were offered pieces of sweet red bell pepper and asked to rate how much they liked it. Every school day for the next two weeks, the children could eat as many pieces of sweet red bell pepper as they wanted. At the end of each week, the kids were asked again to rate how much they liked the peppers. The study concluded that children rated the peppers more highly and were eating more of them – even more so than another group of children who were offered a reward for eating the peppers. The results of the study suggest that a little more exposure and less coercion to “Finish your vegetables!” will teach kids to enjoy new foods, even if they don’t like them at first. Be sure to offer new foods frequently and often. ​Family dinners help kids say “no.” As mentioned earlier, frequent family dinners dramatically lower a teen’s chances of smoking, drinking, and using drugs. The act of sitting down to a family meal together, multiple times per week, can be a simple yet effective tool to prevent risky behaviors among teens. Family meals help kids feel safe, listened to and closer to their parents, which results in more sharing about what is happening in their lives. Plan ahead. Use make-ahead recipes that you can freeze – or use the slow cooker or pressure cooker. Combination slow cooker/pressure cookers can help you get a healthy meal on the table in no time. Sit down with your family to find times that work for family meals. 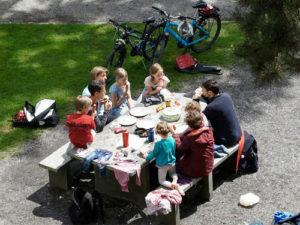 Keep in mind that family meals can be at breakfast, lunch or dinner – during the week or on weekends. Find a time that works for your family, put it on the calendar and stick to it. Try using open-ended questions to start family conversations. One question to ask could be, “What was the most interesting thing that happened today?” This is different than asking, “Did you have a good day?” because it prompts your children to share more than a “yes” or “no” answer.